My research interests focus on conservation biology, particularly using molecular approaches. These methods are very useful to determine population structure at large and small scales, detect migration between demes and evaluate inbreeding. 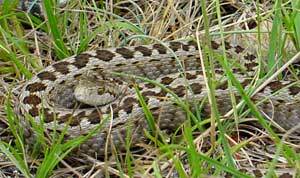 Previous works were focused on the phylogeography, population structure and reproductive success of the European vipers. I am currently developing projects on other reptile and amphibian species, such as the Orisni viper (Vipera ursinii), the slow worm (Anguis fragilis), the smoth snake (Coronella austriaca) or the green toad (Bufo viridis). In fact, most of my research is focused on the reptiles, and particularly vipers due to the lack of conservation biology on the taxa compared to bird or mammal. Moreover, they are interesting models for studies on fitness, population structure and inbreeding avoidance.